Nov. 17, 2017 7:30 a.m.
Ottawa is planning to boost treatment options for opioid drug users as it tries to deal with what Health Minister Ginette Petitpas Taylor is calling a national public health crisis. 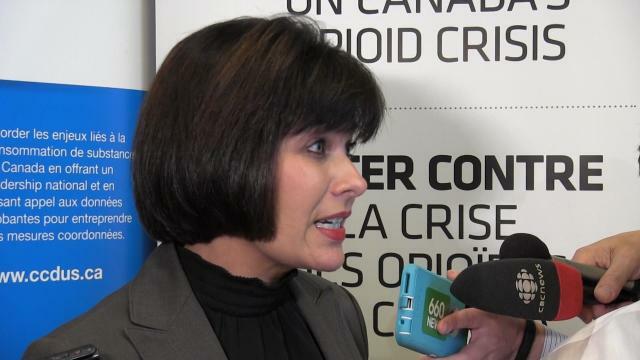 Petitpas Taylor outlined some of the steps the federal government aims to take at a conference Wednesday of the Canadian Centre on Substance Use and Addiction. More than 2,800 people died last year as a result of the crisis and Petitpas Taylor said that number is expected to exceed 3,000 in 2017. In B.C., more than 1,100 lives have been claimed to overdoses so far this year. She said the government plans to support pilot projects to provide safer opioid alternatives, such as the pain medication dilaudid, at supervised consumption sites. There are 25 such sites across Canada and locations for the pilots are expected to be announced in a few weeks. They will be funded through the federal Substance Use and Addictions Program, which provides $26.3 million in funding a year to tackle substance use issues. Petitpas Taylor added that she wants to work with provinces and territories to find a better way to establish temporary overdose prevention sites if there’s an urgent need. “This is an emergency and … sometimes the short-term measures need to be taken to address the reality on the ground,” she said in her speech. Ottawa also aims to hold consultations on removing some of the barriers to obtaining prescription-grade heroin so that users don’t have to visit a hospital several times a day. “Right now, if you would like to provide prescription-grade heroin, it must be done in a hospital setting. We’re consulting on whether or not we should remove those barriers so that it can be accessed in more places,” said Suzy McDonald, assistant deputy minister in charge of opioid response. Another plan is to allow drug-checking services to ensure safety at all authorized supervised consumption sites should they want to offer it. The Liberal government’s most recent budget set aside $100 million over five years to fight the opioid crisis. Petitpas Taylor announced Wednesday that one-third of that money would be put in a harm reduction fund, which includes efforts to prevent infectious diseases like HIV and hepatitis C amongst intravenous drug users. Part of that fund is also earmarked for the Dr. Peter Centre in Vancouver so that it can provide training to new supervised consumption sites across Canada. Petitpas Taylor said decriminalization is off the table.